The Grand Ivy is a young, elegant and relatively new casino, having opened its golden digital doors in January 2016. It provides players with a diverse range of games against the backdrop of its stylish, well-dressed website, complete with crystal chandeliers. The Grand Ivy casino truly offers a refined experience that has led it to rise quickly to the top of the casino rankings! The success is largely down to the NetEnt software that powers the chic gaming parlour. Net Ent also supplies the crème de la crème from its wide catalogue of games, along with a host of other providers including NextGen Gaming, Thunderkick, Nyx Interactive, Betsoft and Leander. For its live casino offerings, The Grand Ivy casino keeps its relationship with NetEnt, but also adds Evolution Gaming to the mix for a wider variety of live gaming options. The Grand Ivy casino is also available on mobile devices. It takes all the features that give the casino its cultivated character and fits them on to touch screens. While it retains the main casino site decor, the mobile site doesn’t have as many titles as the full website, as not all the games support desktop and mobile play. However, there’s still more than enough content to play on the go. While The Grand Ivy casino’s aesthetics echo something out of The Great Gatsby, with the black and slate grey background featuring flourishes of champagne gold, browsing the site is very straightforward. A permanent menu runs across the top of the page, allowing players to access different gaming sections, as well as the promotions. As users browse, a vertical menu appears with all the options. Selecting one quickly loads up what’s on offer, which can then be scrolled through to find the ideal game for every and all players. For those players who’re curious to see what others are getting up to, there’s a ticker counter that lists members by name, the amount they have won, and on which game they won it. This is all in real time, so players can see where Lady Luck is residing and head there. The Grand Ivy casino has more than 500 games in total – with over 400 slot machines to try – that can be browsed by most popular, most recent, or alphabetically. This doesn’t include over 30 progressive jackpot slots, including millionaire-makers such as Mega Fortune, Slots O’ Gold and Hall of Gods. In addition, there are also over 60 classic casino table games and video poker games available on the site. For those who enjoy playing progressive jackpot slots, the site lists the games with the biggest jackpots for easy access. These rotate regularly to show the progressive jackpots of almost all of the games on offer. Being a relatively new casino, The Grand Ivy has a generous welcome bonus to charm new members with. Existing members are also treated to some exceptional offers, including regular blackjack tournaments, and prize draws to win luxury items such as cars and holidays. There’s also a VIP programme that not only has exclusives such as a birthday bonus, but additional perks like same-day withdrawals, cash back offers, private VIP tournaments and invitations to holidays and events. 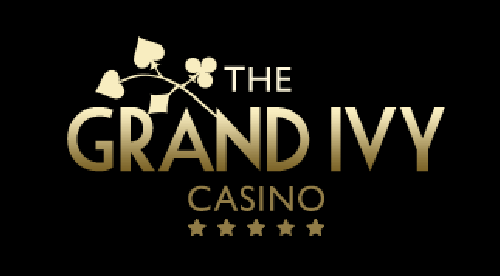 The Grand Ivy casino offers a multitude of deposit and withdrawal options, with Visa and MasterCard debit or credit cards the most popular ones. Players can also use paysafecard, Giropay, Sofort, Dotpay and Trustly. In addition, the casino offers support for eWallet services such as Skrill and Neteller. There are two ways to contact the customer advisors. The quickest method is by using the live chat tab that sits out of the way on the right-hand side of the page. Advisors are on hand 24/7 to chat to you about any query or issue you may experience. The alternative is to send an email, and someone will get back to you ASAP. Despite having been open a relatively short period of time, The Grand Ivy casino has become a go-to portal for a solid gaming experience. The great selection of games coupled with a generous bonus scheme make it worth a look, but players are likely to stick around thanks to the classy design and charming VIP perks!